QTX Mini Warp Laser in red and green. This Mini Warp laser produces some truly unique and interesting gobo patterns. Best projected onto a back drop, ceiling or flat wall, it will really grab the attention of the audience and create an amazing atmosphere. 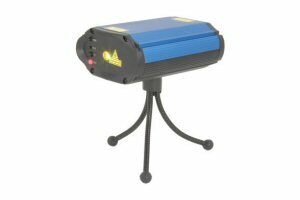 For use in both smoke and no smoke environments, making this laser ideal for mobile DJs and small parties.